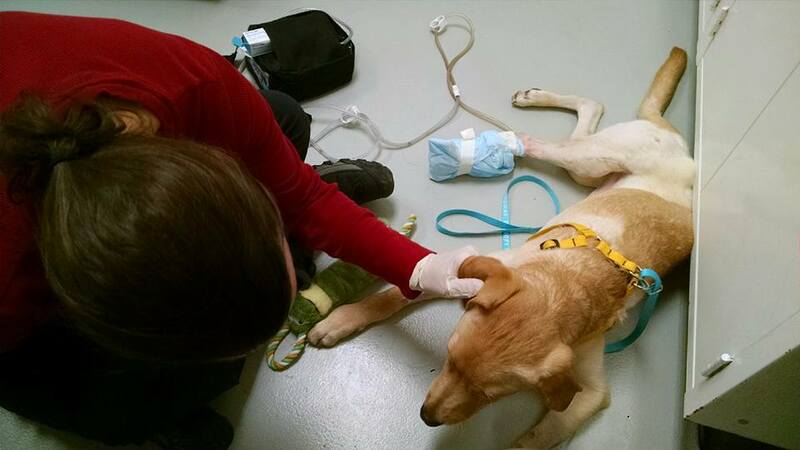 Fundraiser by Michelle Mitzie O'Brien : Help Barley Get Up on His (3) Feet! Help Barley Get Up on His (3) Feet! 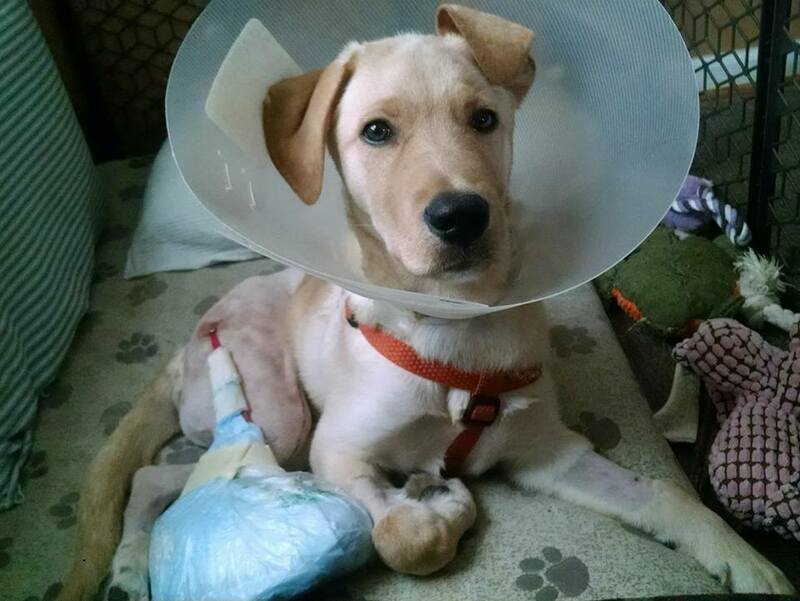 We are seeking assistance to help defray the unexpected and significant emergency veterinary costs that were incurred when Barley - a handsome, smart, and loving puppy - developed medical complications after numerous surgeries to correct a congenital birth defect. Please help out by sharing his story on social media! 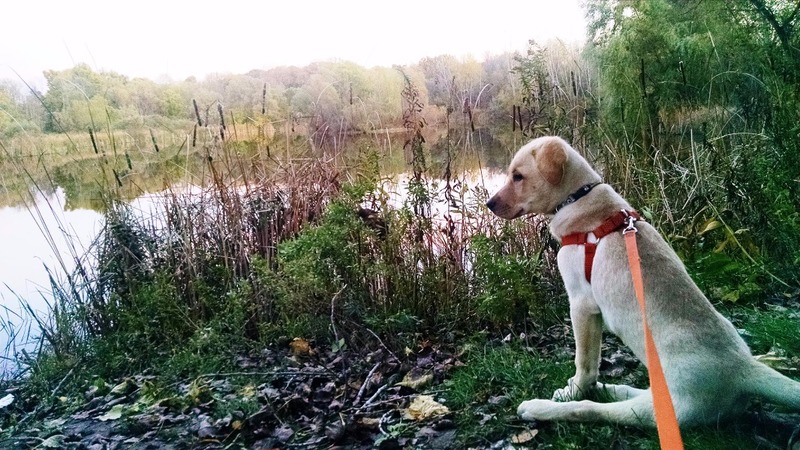 Barley is a 10-month old yellow Labrador Retriever puppy born in Tennessee. The breeder rejected him because he wasn't "perfect" (are any of us?) His hind legs did not bend at any of the joints, and so he relied heavily on his front end strength for mobility, while he "hopped" around as best he could on his crippled hind legs. 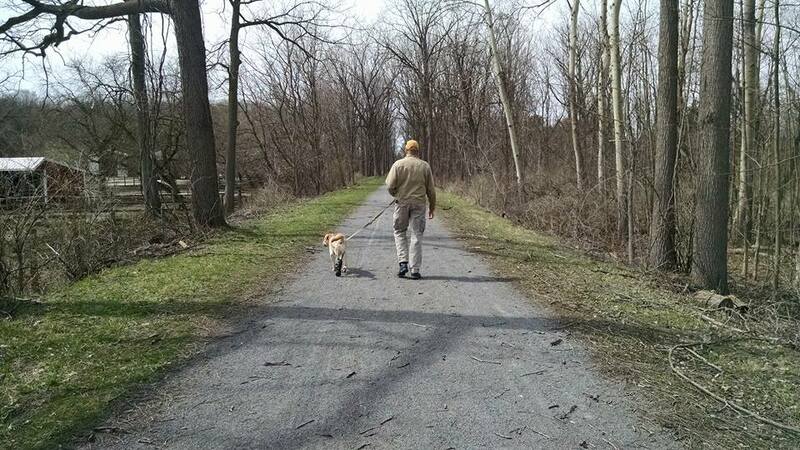 Thanks to a team of selfless volunteers, he was transported to a foster home in Rochester, NY last September. 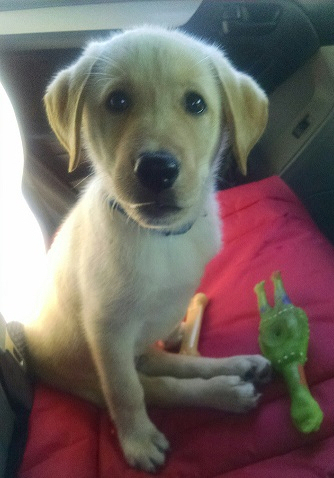 We fell in love with the 10-week old and his "dogged" determination to overcome his handicap, so we adopted him and immediately sought out veterinary advice. Our vet referred us to Cornell University Animal Hospital in Ithaca, NY - about a 2-hour drive from our home - where we learned that his rare condition was called Genu Recurvatum. Cornell had successfully treated dogs with this condition in a single leg, but they had never seen a bilateral case before and were willing to take on Barley's case... as in, right then and there! We literally left Barley with the doctors that day for his first surgery the next morning. Things were moving fast! Our #1 goal was to relieve him of the constant pain he was experiencing as his bones were quickly growing while his muscles were not. A C.T. scan revealed that his bones were becoming deformed due to the pressure being exerted on them by the tight muscles and ligaments. Nov 1, 2016: Surgery #1 on his left hind limb to release leg muscles and splint leg into a normal stance including toes/hock/knee. Dec 22, 2016: Surgery #3 on right hind limb, since scar tissue had formed and again pulled the leg back into it's previously rigid position. We brought him home on Christmas Eve. 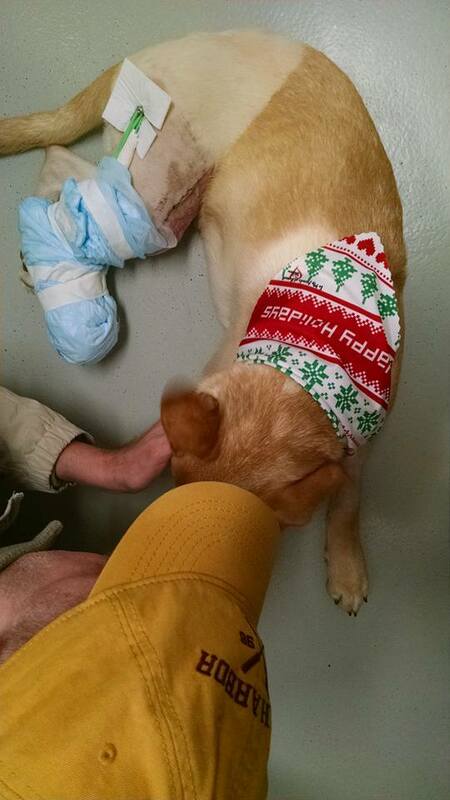 Dec 30, 2016: The first complication - a bandage sore on his right hind foot became infected with MRSA and progressed extremely rapidly to the point where Barley needed multiple skin grafts to assist in wound closure and a special vacuum pump to expedite wound healing. Even so, he lost all of his paw pads on his right foot and endured Surgery #4 to amputate 1-1/2 toes. The remaining tissue took almost 5 months to fully heal, during which we were taking time off from work to commute to Ithaca 2-3 times each week for bandage changes and wound monitoring. 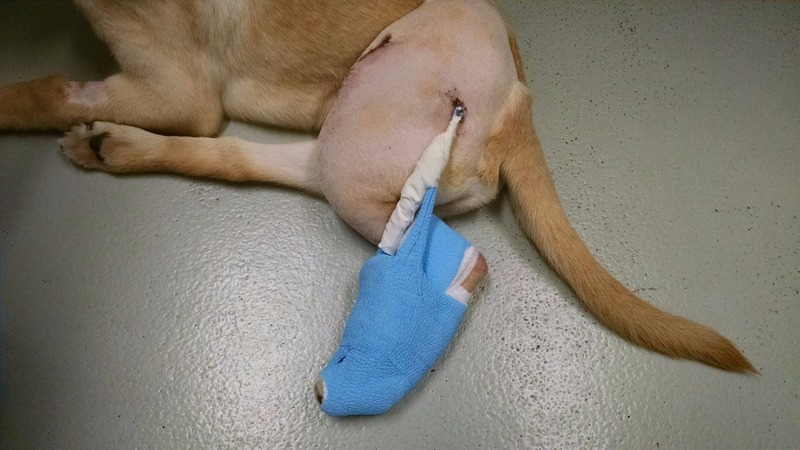 Thank goodness most of Barley's foot was saved, and surgeons later performed a partial pad transplant so that he would at least have partial traction on that foot. June 1, 2017: Surgery #5 on the left leg to remove scar tissue that had again formed and was preventing him from flexing the knee and being able to reach the ground. To everyone's horror, Barley's leg developed Deep Vein Thrombosis, a condition so rarely seen in dogs that Barley's surgical team was shocked at the diagnosis. DVT formed clots in his leg and prevented adequate blood flow. This in turn enabled the MRSA bacteria to once again attack his incision, and although a valiant effort was made to save Barley's leg, the damage had already been done. June 9, 2017: Surgery #6 was reluctantly performed, wherein Barley's entire left leg had to be amputated at the hip in order to spare his life. Today: As a post-surgical precaution, Barley remains quarantined in ICU on one of the most powerful I.V. antibiotics available. It is literally a last line of defense, with Barley's very survival hanging in the balance. We remain tremendously impressed with the professional care, loving attention, and extraordinary efforts being expended on Barley's behalf from everyone he has encountered along his journey to freedom and mobility. The good news is that Barley no longer has leg pain, and he has a normal stance in his remaining hind limb. Since his remaining hind limb is now missing paw pads and has only 2-1/2 toes, we're hoping a customized boot or prosthetic will enable him to run and play with the other dogs one day! Throughout it ALL, Barley continues to wag and be (over)eager to greet everyone he sees, especially his beloved medical team. His spirit and determination are such an inspiration - he is our hero! Thank you so much for reading Barley's story and considering a donation to help defray his unexpected and rapidly escalating medical bills. If you do decide to help Barley, then Barley says WOOF!-WOOF! (translation: THANK YOU!) It would also help if you would be kind enough to spread the word about Barley by sharing his story with anyone else you know who may be able to help him recover from this devastating series of setbacks. Hi everyone, we've had the BEST progress this week because yesterday Barley got to come HOME!! After last Friday's removal of the vacuum bandage Round #2, the doctor's were very pleased with the status of his incision. On Sunday morning, after 21 days in ICU isolation, he was moved into a regular ward and then the next day- home with us! We are still watching the incision vigilantly until the sutures are removed in 6 days but it's so good to have our Barley home where he belongs. He's on restricted activity until his sutures are removed, so that is a bit challenging but he's a great patient. He remains a happy 11-month old puppy and we are committed to keeping it that way. Once he is cleared for activity, we'll begin physical therapy to help him adjust to life as a "tripawd" and to teach him that he really can use his rear leg (currently, he's 100% on his front legs which is not ideal for his spine over the long term). We'll also get him back to swimming in order to build up his back leg and hip muscles, and to burn off some puppy energy by having fun in the water. Thank you again for the tremendous support - we are so grateful to have come this far in the journey and can't wait to see Barley blossom. Barley's made some very encouraging progress this week! As of this evening, the vacuum bandage was removed because it seems to have done it's job. His incision is still not fully closed, but the tissue had been healthy enough to be sutured together earlier in the week and tonight it was dry enough to have just a regular bandage on. We find out tomorrow if he is able to be released from ICU and put into the regular hospital, which would be huge for his mental health. He hasn't been able to be outside for almost 3 weeks! Thank you so much for the continued support and well wishes for our little dude. We are cautiously optimistic that his progress will continue and that we will have him home SOON! Hi everyone. 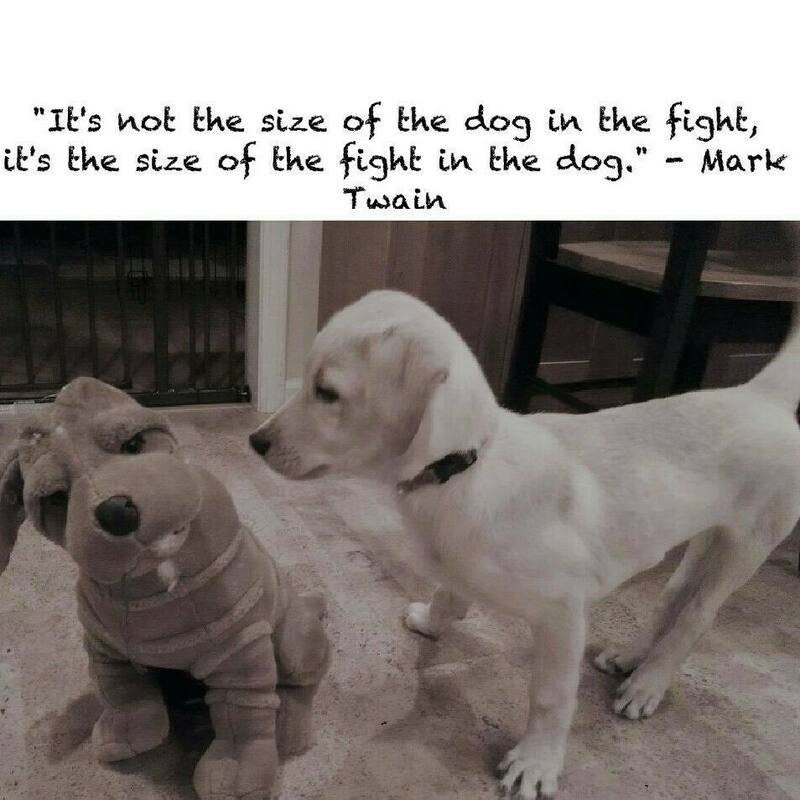 Thank you so much for your support and for sharing Barley's story. As of right now there's not much to say in terms of an update on our boy. He remains hospitalized in ICU isolation, fighting like a champ against the bacterial infection that caused him to lose his left leg. He continues to be administered one of the strongest antibiotics available, and doctors have placed medical grade honey and a vacuum bandage on his incision site to hopefully expedite the wound closure process. He is a true fighter - he is eating well, resting comfortably, and is a very cooperative patient. 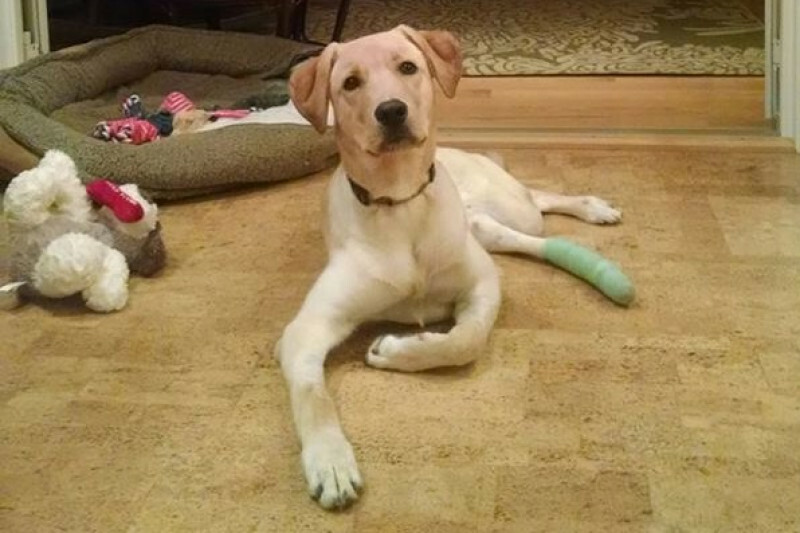 It's a tough situation for an eleven-month old puppy to be in, so please keep the positive thoughts coming his way. We truly appreciate it!